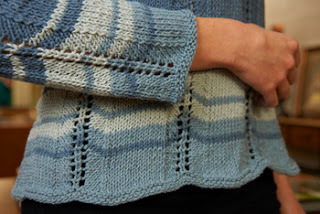 Yippee, I can finally blog about my exclusively designed Chevron Sweater (product #3807) for Kollage Yarns! 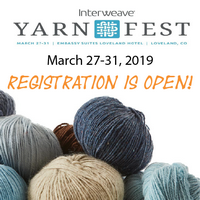 The yarn is called Riveting Worsted, is made of 100% recycled yarn from recycled blue jeans and comes in 9 wonderful colors (163 yd/149 m per 3.5 oz/ 100g). And even though it is a typical, thicker weight cotton, it makes for a nice, soft drape as you can see in the photo above. 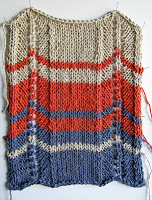 The sweater itself is an A-line sweater with a square neckline and instead of just straight horizontal stripes at the bottom, I’ve turned the stripes into a variation of a chevron pattern with vertical eyelet columns. My original swatch was a bit more colorful (I love color) and I’ve posted it here to give you another color combination option. The body is worked in the round from the bottom up, then the piece is split into front and back and worked separately back and forth. For the top part, the eyelets are replaced by M1 increases to from a less revealing fabric. The sleeve is worked back and forth and and has a sleeve cap for a nice fit. A double eyelet column runs down the center of the sleeve for added visual interest. I think it makes for a fresh but classic sweater design. You can purchase this pattern for $7.50 via Kollage Yarns’ website.